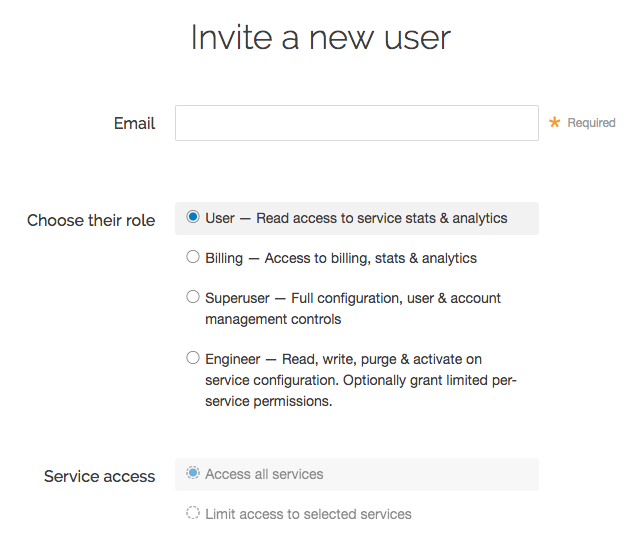 Fastly allows you to add users to your account, assigning them different roles and permissions as appropriate. You can delete user accounts when you no longer want them to have access. IMPORTANT: You must be assigned the role of superuser to add users to or delete users from an account. TIP: Adding a new user to make them the billing contact for your account? Follow our billing contact instructions instead. Click the User management link. In the User Invitations area, click the Invite button. The Invite a new user page appears. In the Email field, type the email address of the user to invite. From the Choose their role options, select the role to assign the user once they accept the invitation. From the Service access controls, optionally select Limit access to selected services to limit access to selected services for users assigned the role of engineer. 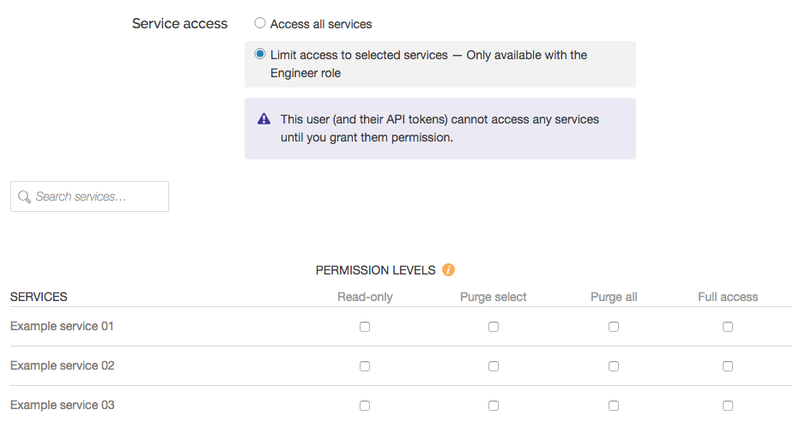 If you've chosen to limit access to selected services for a user assigned the role of engineer, select the specific permission levels for each service associated with the account. Click the Invite button to send an invitation to the email you specified. The email address of the user you invited appears in the User Invitations area and remains there until the invitation is accepted. TIP: If you need to send an invitation to a user again, click the Resend Email button. To add an existing user to your Fastly account, have them cancel their existing account and then re-invite them by following the steps to add a new account user to your account. We associate a user's email address with an account. Canceling that account allows the email address to be reused. NOTE: Account cancelation might not be an option in some situations. Contact support@fastly.com to discuss how accounts can be combined. TIP: Deleting the owner of the account? Be sure to transfer ownership first. In the Users area, find the name of the user to delete. Click the gear icon to the right of the user to be deleted, then select Delete from the menu that appears. A confirmation window appears. If the user has active API tokens associated with their account, click the Review this user's API tokens link to manually review and revoke them. Alternatively, select the checkbox to automatically revoke all of the user's API tokens and delete the user.